Cats are generally curious (hence the popular idiom) and love to play and explore. While climbing on the back of your couch or swiping at toys are certainly pastimes your cat may enjoy, some owners have taken their pet’s play needs to the next level (quite literally). Cat playgrounds are a big trend that feature suspended climbing structures cats can scale, and many designs weave throughout an entire house or apartment. 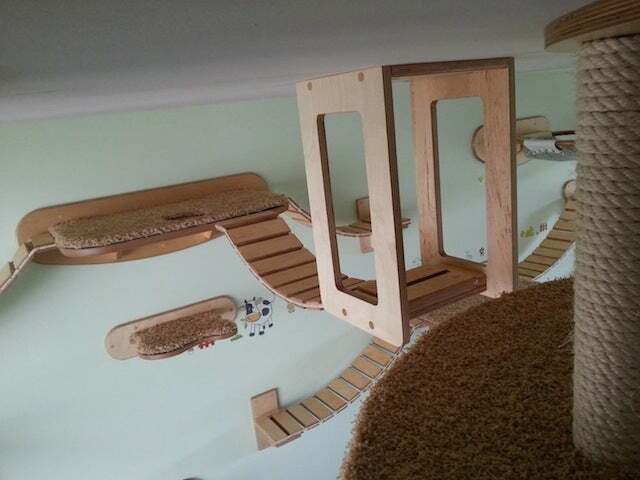 For example, this play structure features ramps that lead cats upward against the wall. Once perched at the top of the ramp, the animals can leap to other platforms, crawl through tunnels or lounge in carpeted cats’ nests. Other designs may include stairs and walkways, some of which even lead outside. The trend has brought new business to design companies specializing in pet spaces. For instance, Goldtatze is a German company that creates and builds cat furniture that caters to each individual pet. “The surroundings for a cat should be as unique as the being itself,” the company notes on its website. As a result, cat domains have become functional works of art that can blend into your living space and provide your feline friend a fun place to explore.